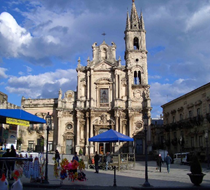 Acireale, in Italy, is a nice city near Catania. 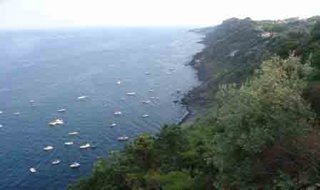 It enjoys a splendid position near the seaside and is situated on the Timpa, a green plateau, covered with citrus plantations, between the slopes of Mount Etna and the sea. 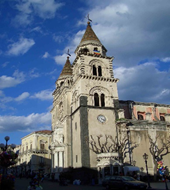 Acireale is built over a lavic territory, and it boasts a conspicuous production of citrus fruits, cereals, other fruits, and vegetables. It presents a characteristic handicraft, based on objects in lava-rock and on wrought iron. It is famous for its neogothic cathedral, Saint Peter's Basilica, and its paintings, such as The Basilica di San Sebastiano whose shapes summarize the entire baroque movement in Sicily. 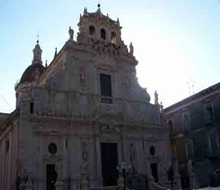 The oldest academy in Sicily, the "Accademia dei Dafnici e degli Zelanti" is located here. Every year in Acireale is celebrated the most beautiful Carnival in Sicily, which has strong folkloristic and tourist values for the city. The main attraction of the carnival are the typical allegorical and flowers wagons, which attracts a great number of tourists and it is recognized as one of the most famous events at international level. Sicily is the largest region of Italy. 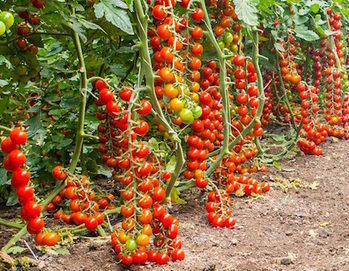 The agricultural sector with the touristic sector is strategic for the economical aspect. Area used for agriculture is about 1,350,000 hectares, with 219,000 farms (13,5% of national total). The organic agricultural sector is expanding and Sicily as a region has the largest number of organic businesses/farms (11,626, namely 15,32% of the national total) with a substantial increase also in terms of area certified (427.294 hectares, Sinab 2017) that is equal to 31,6% of total regional utilized area. The cereal sector counts 290 thousand hectares that represent about 14% of the Italian figure (Istat, 2017). Organic cereal is equal to 57,881 hectares (Sinab, 2017). In the olive oil sector, Sicily is the third Italian producer after Puglia and Calabria, with 160,000 hectares of olive groves equal to 13,7% of the national figure (Istat, 2017): of these, 42,101 hectares are organic (Sinab, 2017). In the citrus fruit sector, Sicily gains the first place in the Italian regions with 84 thousand hectares of land in production equal to 56% of the national figure (Istat, 2017). 25,339 ha of these one, are organic (Sinab, 2017). Sicily represents one of the most important contributors to the Italian wine industry: with over 105 thousand hectares in 2017, it is the region with the largest area of vineyards in Italy, corresponding to around 17% of the overall Italian vineyard area (Istat, 2017); in the same year Sicily produced nearly 0.6 thousand tons of grapes for a value of 280 million euros. The sector presents a high number of quality awards obtained. The commercial flow of Sicilian wine is significant, and with its positive balance significantly influences the agri-food balance of regional trade. In terms of employment, Sicilian agriculture absorbs over 26 million working days with 105,000 employees, ranking second after Puglia. In the livestock breeding sector, companies have increased over the last decade, in contrast with the national figure and the number of animals raised per company is also increasing. 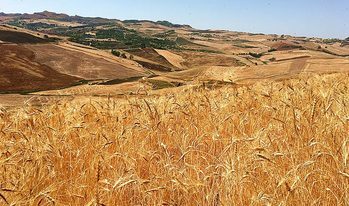 The total value of agricultural production in Sicily in 2017 was about 4.7 billion euro.